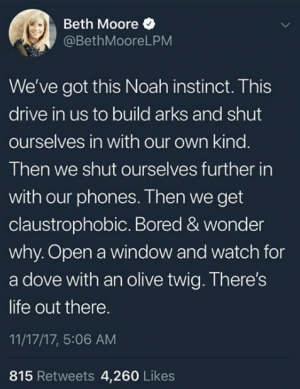 Again proving herself unable to exposit Holy Scripture in the most fundamental or elementary way, Beth Moore drew ire on Twitter for allegorizing the story of Noah’s Ark to mean something about…well, something. It didn’t make much sense. Noah wasn’t in the ark because he had an instinct. He was in the ark because God promised him he was going to destroy the world with a giant, global flood that was going to drown everyone (Genesis 6:14).